Woah. So it seems like my last three posts were all pretty epic: April's Unblogged Files, the nine-course degustation at Jacques Reymond and all those cakes and Brazilian treats at my friend Daisey's birthday. I've got a heck of a lot of restaurant posts coming up due to my extended thirtieth birthday celebrations too - phew! 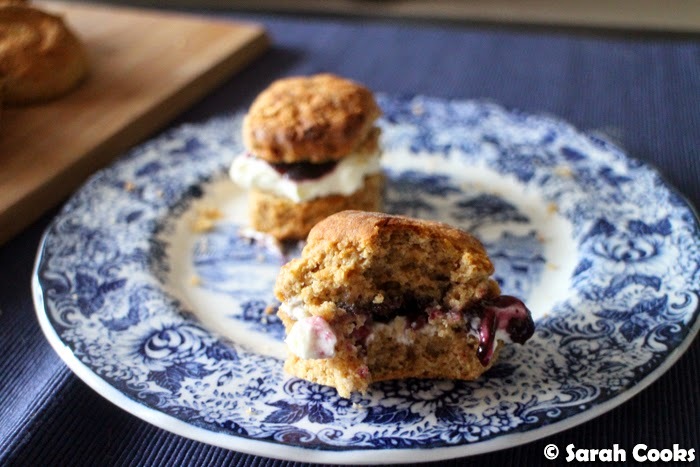 So for today I wanted to do a sweet and simple recipe post: scones! I had half a carton of buttermilk in the fridge, and all sorts of fancy flours in the pantry - and that was all the encouragement I needed to whip up a batch of scones. My recipe-finding method wasn't too scientific; I just google-imaged "spelt flour scones" and clicked on the first picture that looked good! 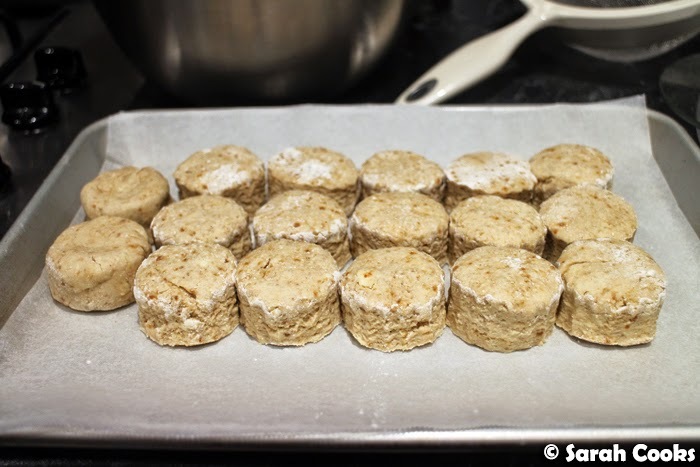 This method led me to the Wholefoods House website, and their recipe for spelt and buckwheat scones. I adapted their recipe a bit - replacing the milk with buttermilk, (I love the combo of whole grain flour and tangy buttermilk), replacing the raw sugar with coconut sugar, and halving the baking powder. (The original recipe called for four teaspoons of baking powder to three hundred grams of flour which seemed like way too much! Luckily, my scones still rose satisfactorily, and they didn't have that bitter bicarby taste). Scones don't really take much time at all - about twenty minutes preparation time, and fifteen minutes in the oven, and your reward is a tray of steaming, fluffy deliciousness. Indeed, I made these on a Monday night after the gym and dinner, and before watching a recorded episode of The Real Housewives of Melbourne, slumped on the couch. (Don't judge, just love). Also, go Gina. And go Chyka. And why can't they all just get along!? I loved the scones so much! 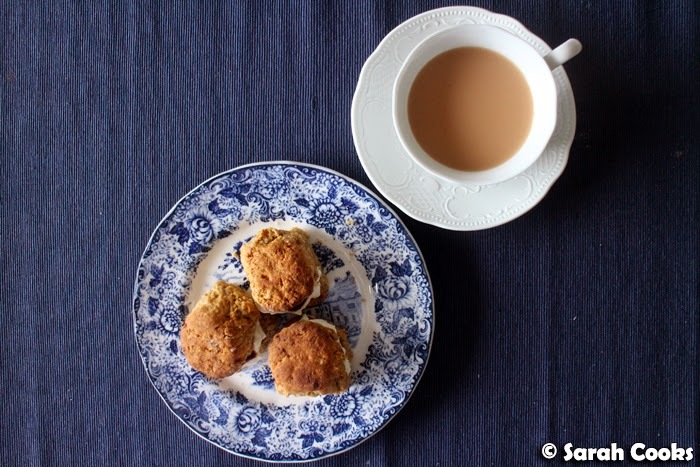 The spelt and buckwheat flours gave the little scones a hearty texture and wholesome flavour, and the coconut sugar that I used added to the slightly crumbly, delicate texture. They just had a lot more interest and heft than a regular white-flour scone. Most scone recipes I've used don't have much, if any, sugar (see my previous scone posts: Scones, and Date Scones, for comparison). 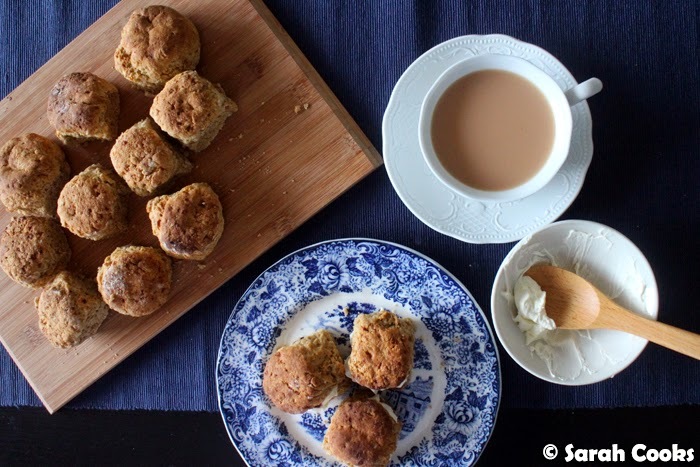 Interestingly, this recipe uses a quarter cup of sugar in the recipe, but these scones are still quite savoury. They're fabulous with double cream and jam, but I think they'd be equally at home with a little sharp cheddar and quince paste. (Or, you know, ravenously wolfed down with some peanut butter and nutella after work but before dinner... I imagine). Scones are always best fresh out of the oven, but I found they were still good the next day, briefly microwaved, for breakfast and even by the evening. Yay! Sift the flours, baking powder and bicarb into a large mixing bowl. Stir in the salt and sugar. Grate the butter into the bowl, using a coarse grater. Rub the butter into the dry ingredients using your fingertips, until the butter is incorporated evenly and the mixture resembles sand. Make a well in the centre, and pour in the cream and buttermilk. Stir in gently using a butter knife. 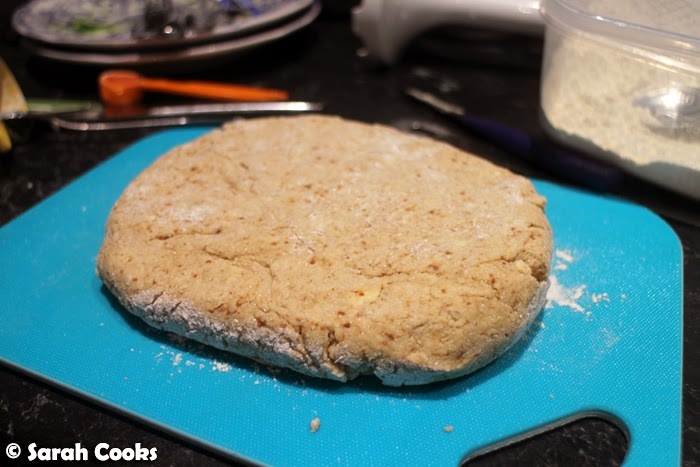 Turn the dough out onto a floured surface and knead very gently, just to bring the dough together. Pat out into a 3 centimetre thick rectangle. Use a 4.6 centimetre floured cutter to cut out scones, moving the cutter straight up and down, not twisting it. Arrange the scones close together on the baking tray. Bake for 12-15 minutes or until golden and cooked through. Allow to cool slightly before serving with double cream and jam, or sharp cheddar cheese and quince paste. So pretty!!! Love it, love it! I've never cooked with spelt flour before. I should give it a go. And RHOM does my head in. Gina and Chyka are the only normal ones. The rest are awful! Oh they look gorgeous! I only make the lemonade scones, but I think I should try these ones! Um like how amazing do these scones look! 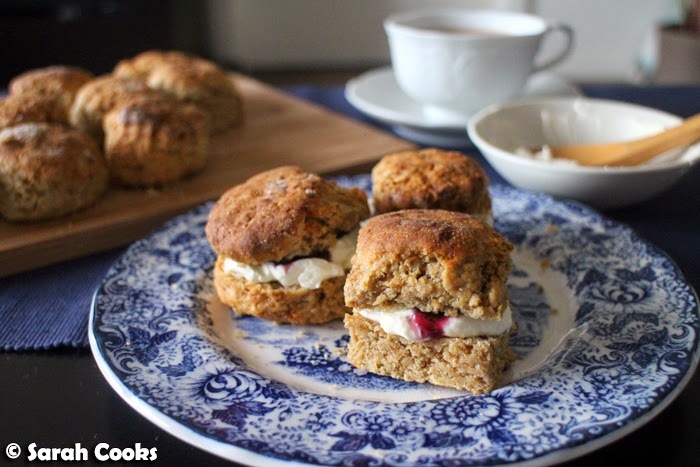 I like to think that scones are merely a carriage for cream but these look stunning on their own too. Ok I lied. I want lashings of cream anyway. Proper Devonshire Tea is one of the things on my TO EAT IMMEDIATELY UPON LANDING IN AUSTRALIA (also: steak sanga, wedges with sweet chilli and sour cream) but I'm now thinking that instead of demanding my parents drive me out to a cafe in the country, we show up at your place instead. Good plan? Good plan.